Back cover blurb: 2007: at the end of a momentous day, Charlie, Stella and John cross paths under the arches of Paddington Station. As Charlie locks eyes with Stella across the platform, a brief, powerful spark of recognition flashes between them. But they are strangers … aren’t they? Plunging back thirty years we watch as, unknown to them all, the lives of Stella and John, and Charlie and his girlfriend Beth, are pulled ever closer, an invisible thread connecting them across the decades and through London’s busy streets. For Stella, becoming a young mother in the 1970s puts an end to her bright academic career in a way John can’t seem to understand. Meanwhile Charlie gambles all future happiness with Beth when his inner demons threaten to defeat him. 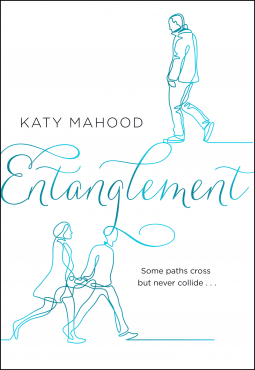 In rhythmic and captivating prose, Katy Mahood effortlessly interweaves the stories of these two families who increasingly come to define one another in the most vital and astounding ways. With this soaring debut, she explores the choices and encounters that make up a lifetime, reminding us just how closely we are all connected. Entanglement was an unexpected joy of a novel for me. When I first started it I was a little apprehensive as it took me a while to get used to the characters and how their lives were interwoven with one another. Stella and John. Charlie and Beth. London, 1977. Two new couples starting their journeys together in life whose life’s are changed forever by two totally separate events. The first is the bombing of a London pub by the IRA. The second an unexpected but not necessarily unwanted pregnancy. Both couples are very young and ultimately unprepared to deal with the very adult decisions that they must now face. The tales of these two couples are effortlessly interwoven by this author, and as their paths cross through the following years that become irretrievably entangled in one another’s lifes. Though they don’t discover this until much later in the novel. Entanglement is a beautifully written novel spanning some thirty years. It is an impressive debut, and I look forward to this authors next novel. Entanglement is available now via Amazon online and all good book shops.